The newly bullish tone for Bitcoin prices has fed through to crypto-related companies’ shares. The largest cryptocurrency continued its unexpected march higher this week, surging to as high as $5,316 in late U.S. trading before paring back some gains by Asia hours Thursday. The Bloomberg Galaxy Crypto Index, which tracks a basket of the largest digital tokens, has rallied as much as 28 percent this week, on track for a fifth straight weekly gain after months of relative inactivity. 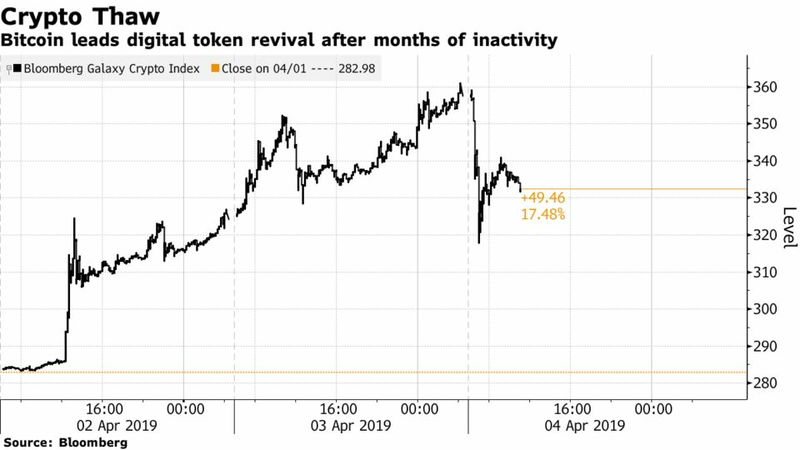 Crypto-linked stocks in Asia also extended gains, led by Remixpoint Inc. in Japan with a jump of as much as 16 percent during the day Thursday. It’s up 26 percent so far this week. 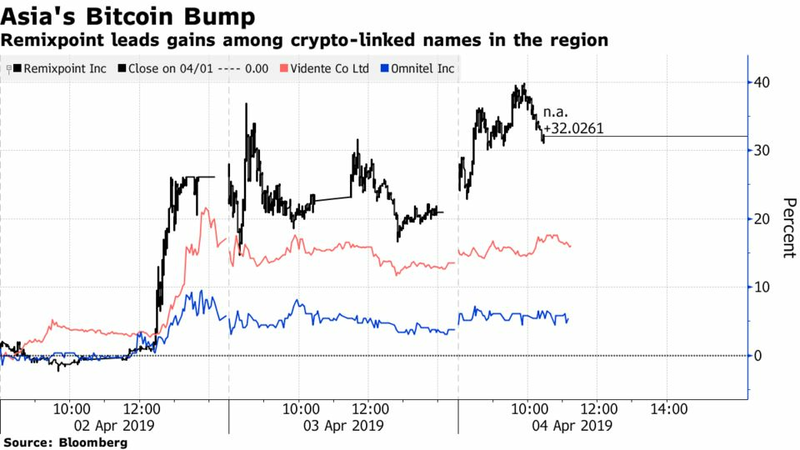 Vidente Co. has climbed almost 20 percent since the weekend, while Omintel Inc. is on a 6.3 percent advance. Bitcoin’s late gains helped fuel a post-market rally in U.S. small-cap crypto stocks after Wall Street closed. Riot Blockchain Inc., which had already advanced 12 percent during Wednesday trading, extended that by as much as another 12 percent to touch $5.42 after the close, though it later lost the gains. 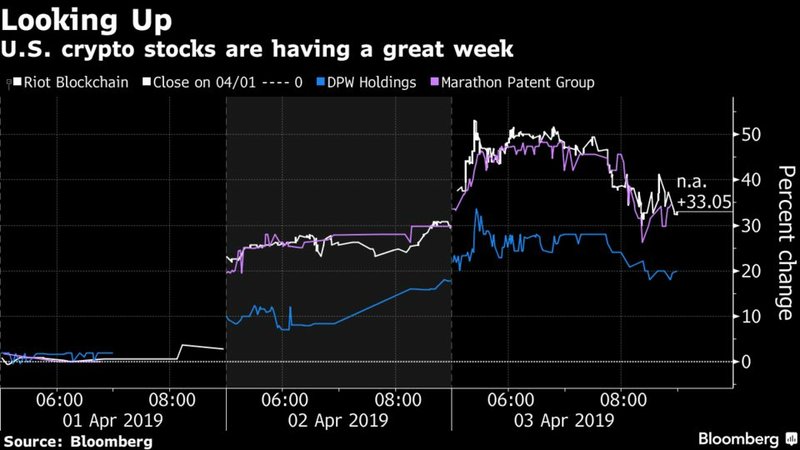 Smaller crypto firms DPW Holdings Inc. and Marathon Patent Group Inc. also rose further for a time after the close. And things are looking up for crypto investor and billionaire Mike Novogratz. Shares of Galaxy Digital Holdings Ltd., the Toronto-listed part owner of the hedge fund manager’s crypto merchant bank Galaxy Digital Holdings LP, is up 159 percent this year. That’s after a dismal 2018, when its trading desk lost $136 million in nine months.